We’ve recently completed a survey through city building permits, collecting information on every home built here in the Alameda Park addition. It’s taken two years and more than a dozen visits to the Bureau of Development Services (which has been very accommodating and helpful), but time well spent, given the insight it offers into the development of the early neighborhood. 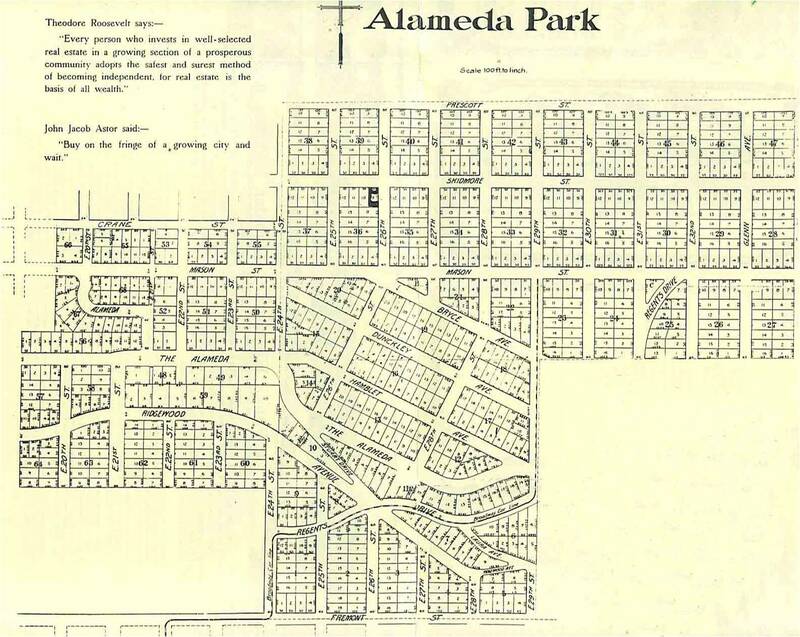 Everything from the date of construction—it’s interesting to see what parts of the neighborhood were built first—to identifying the most prolific builders, and all of it helps paint a picture of how Alameda Park developed. Original building record for Alameda School, taken out on November 7, 1921. Information from more than 1,025 Alameda Park building records were reviewed as part of the study. The first observation has to do with the general timing of construction in Alameda Park, from just two homes built in 1909 to a peak of 139 built in 1922. One factor in the timing of this was the ebb and flow of the economy. Strong in 1910, but the infrastructure hadn’t yet caught up. Slow in 1918-1919. Explosive in the 1920s with both a strong economy and demand, and an infrastructure that was truly ready for development. Building permits issued in the Alameda Park subdivision, by year, 1909-1934. From permit study by Doug Decker, 2010. By 1934—the end of this graph—about 85 percent of the neighborhood had been built out (the late 1930s and 1940s are a mere trickle of a couple or three homes per year, if that). 1922 would have been an interesting time here in Alameda, with an influx of neighbors. If you haven’t read it, go back and look up our post about the Alameda Park Community Church and the pastor’s desire to bring together new neighbors who were strangers. That was 1922 here in Alameda. Another observation from the permit study is to have a look at the spread of construction activity to see which portions of the neighborhood were built out first: the areas around 24th and Dunckley; 25th and 26th below the ridge; 29th and Mason; and 32nd Place (then called Glenn) from Mason to Hamblet. These highlighted areas below indicate in general the earliest construction from 1909 to 1912. It’s also interesting to see who was doing the building during these years. A handful of builders built a large percentage of the homes. The list we’ve compiled below shows total homes constructed in Alameda Park by each of the most prolific builders. Many of these we’ve profiled here, others we’re still working on. In addition to the general trends, there are specific sad stories: more houses than you might imagine have had fires (and fire repairs, hence the permit records). A couple of homes were actually struck by lightning. A fad of game rooms, recreation rooms and wet bars were put in during the 1950s, and even an exercise room way back when. Sadly, too frequent removal of trim, built-in shelves and other architectural details in a attempt at modernization (gasp). Interesting to note how many wooden front porches were rotting apart by the 1950s, and a spate of concrete porches and steps poured in replacement. It’s also clear, when you look at the permits, why Portland’s addressing system was changed in the early 1930s. Some of our homes here in Alameda have had three addresses prior to the Great Renumbering (particularly on NE Bryce Avenue) as numbers had to be skootched over to make room for new houses built on empty lots. Let’s just say the original numbering system was less than scientific. You can see this on the actual building permits themselves, where one address has been scratched out and the new one written in. History in the making. It wasn’t scratched out in the example above, but you can clearly see Alameda School’s pre-address change number: 864 Fremont. Another observation as we completed the study was just how many homes do not have an original building permit. Over the years, for whatever reasons, the City has lost perhaps as many as 20 percent of the original building permits, particularly in the early years. For these homes, we have to rely on original plumbing permits which always give the construction date, but can be sketchy with owner and contractor information. Regardless, as you handle these permits, some 1,025 in all, you feel time passing through your fingers. You see the clerk typists punching in the details. You sense the contractors standing in line, waiting at a counter wishing they could be back on the job instead of in the permit office. You witness the many inspectors and their mostly neat observations, drawings, complaints and even sarcastic remarks in shorthand on the 4 x 6 manila cards. And you can’t help but wonder what it will be like 100 years from now when someone wants to research the history of your house. What story will your house be able to tell? How can one find out where and how to do history research on old houses and the social history of the family living in the house? Besides looking on the internet, how do history detectives find their information and where do they find it? Hi Barbara. Thanks for dropping by the Alameda History blog. What you are describing–the social history of a house, the memories and experiences of those who have known and shaped your home over time–is (for me) what old house history is all about. I applaud you for being curious about these things. 1. Here on the blog is a resource sheet that I prepared that will give you some ideas about places to start looking (click here to have a look). They are the sources I use when I complete a house history study. Combine the information you’ll learn from these sources with some basic genealogy tools (the census, death records, obituaries), and you can unlock clues to living family members. This is where the stories, photos and understanding of your home’s history resides. And it’s a precious non-renewable resource, so time is of the essence. 3. I’m pleased to provide friendly and free advice as you undertake your own search. I’m also available to do the work for you, if you wish. You can read more about my research services here on the blog by clicking here. …assure the data integrity is something I wonder about.